Among others, the role of CO2 changes in shaping Quaternary climate dynamics is not yet fully understood, largely because of the poor observational constraints on atmospheric CO2 concentrations for the time before 800,000 years BP, beyond the period covered by high-quality ice core data. The model simulations provide a self-consistent reconstruction of CO2, climate and ice sheets constrained by available observations, i.e. oxygen isotopes and reconstructions of sea surface temperature. The fact that the model can reproduce the main features of the observed climate history gives us confidence in our general understanding of how the climate system works and provides some constraints on the contribution of external forcings and internal feedbacks to climate variability. Our results imply a strong sensitivity of the Earth system to relatively small variations in atmospheric CO2. A gradual decrease of CO2 to values below ~350 ppm led to the start of continental ice sheet growth over Greenland and more generally over the NH at the end of the Pliocene, beginning of Pleistocene. Subsequently, the waxing and waning of the ice sheets acted to gradually remove the thick layer of unconsolidated sediments that had been formed previously over continents by the undisturbed action of weathering over millions of years. The erosion of this sediment layer – it was essentially bulldozed away by moving glaciers – affected the evolution of glacial cycles in several ways. First, ice sheets sitting on soft sediments are generally more mobile than ice sheets grounded on hard bedrock, because ice slides more easily over sediments compared to bedrock. Additionally, glacial sediment transport to the ice sheet margins generates substantial amounts of dust that, once deposited on the ice sheet surface, increases melting of the ice sheets by lowering surface albedo. Our results show that the gradual increase in the area of exposed bedrock over time led to more stable ice sheets which were less responsive to orbital forcing and ultimately paved the way for the transition to 100,000 years cycles at around 1 million years ago. The simulations further suggest that global temperature never exceeded the preindustrial value by more than 2°C during the Quaternary. Ice sheet evolution is very sensitive to temperature, and the initiation of NH glaciation at around 3 million years ago would not have been possible in the model if global temperature would have been higher than 2°C relative to preindustrial during the early Quaternary. Since the model has been shown to accurately reproduce the sea level variations over the last 400,000 years and also the spatial ice sheet distribution at the last glacial maximum (Ganopolski & Brovkin 2017), we are confident that the sensitivity of ice sheets to climate is well represented in the model. 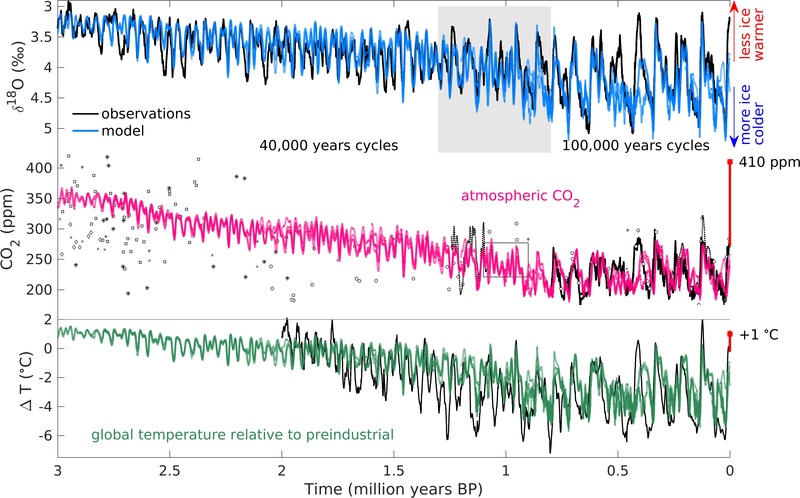 Likewise, our results indicate that the current CO2 concentration of ~410 ppm is unprecedented over the past 3 million years. The climate sensitivity of the model is around 3°C global warming for a doubling of CO2 concentration, which is at the center of the range of current best estimates of climate sensitivity that range between 1.5 and 4.5°C. It is possible that the real climate sensitivity is lower than 3°C, in which case the modelled CO2 concentration needed to fit the oxygen isotope record during the early Quaternary would be higher than in the present model simulations, but it would still be unlikely to exceed the present day value. In the context of future climate change, our results imply that a failure to significantly reduce CO2 emissions to comply with the Paris Agreement target of limiting global warming well below 2°C will not only bring Earth’s climate away from Holocene-like conditions, but also push it beyond climatic conditions experienced during the entire current geological period. Human CO2 emissions have already so massively disturbed the natural climate cycles that within the last hundred years they have more than undone the previous 5000 years of natural cooling due to the precession cycle, and global temperature is now already higher than at any time in the Holocene and thus the entire history of human civilization. The same model that, in the present study, has been shown to be able to simulate the past 3 million years of natural climate variability also predicts that our CO2 emissions since the industrial revolution were so large that they will disturb the natural ice age cycles for tens of thousands of years to come because of the very long legacy of our fossil CO2 in the atmosphere (Ganopolski et al., 2016). It would be interesting to hear Dan Lunt’s (U. of Oxford) comments on this as he is known for his work in the mid-Pliocene. His mean values for the mid-Pliocene were CO2=390 ppm with T=2.9 deg above our pre-industrial. When I asked if he had a value for CO2e for the time, he said they were still working on decreasing the range of CO2 which was believed, a few years ago to be between 360-420 ppm. He did say that they had done some estimates (no published papers) using the Quarternary ice cores which gave a CO2e of about 20 points higher than the CO2 value. We are now obviously much higher. Thanks for the paper and the writeup. I had no idea that regolith thickness was a key control on ice sheets. The results are very nice, but i understand the Antarctic ice sheet in the model is not dynamic ? What would happen if you made, say, WAIS dynamic ? A significant milestone, I should think. From a more practical point of view, I note the support for ~3C climate sensitivity–given the complexity of the model, I presume this was emergent from the physics–and also the likely consequences of the present GHG trajectory. I dont beleive it but will use it for midterms! Thank you, very interesting. The article itself does not have any quantitative details about what Earth’s ‘orbital variations’ mean. Can anyone expand on this topic a bit as it relates to this report? So does that prove climate sensitivity is 3°C? No of course not. But how could the model work if climate sensitivity is wrong? The same way that a poor student can get an A on the final, he has the answer key or in this case the historical temperature record. [Response: It doesn’t prove it, but with a model with much lower climate sensitivity it is very difficult to get the right amplitude of the ice age cycles in agreement with the proxy data, given the strength of the forcing there is exactly known. We used an earlier version of this model to systematically constrain climate sensitivity based on proxy data of the last glacial maximum. I can understand how you might have a tendency to first think of how a poor student can do well on an exam, but for those of us that are good students, we can also imagine that it is possible to get a good mark because you actually understand the material. If one model were all you had to work with your implied criticism might make some sense. But the case for warming in general and for a sensitivity between 1.5 and 4.5 is based on scores of lines of evidence. To continue your “reasoning”, a poor student might well ace one test by having the answer key. But said student is highly unlikely repeat this effect for long on different tests in different classes for different teachers. This is how nonexperimental sciences work, btw. VERY INTERESTING. And certainly makes sense. I suppose I had just assumed that glaciation would scrape down to bedrock the first time it happened. But if this was progressive over many cycles that explains a lot. All the intermediate peaks you see in the ice-core records before the final deglaciation to an inter-glacial make sense. If the speed of the glacial flows is slower, because they are flowing over bedrock, then each time the 44K cycle kicks over to warming, the ice sheet can’t react fast enough to bring on much of an albedo feedback quickly enough, before the M-Cycle flips and down it goes again. So this begs the question. What is different to trigger the final deglaciation in each 100K cycle? And scary thought. Could a situation arise where that final mass deglaciation is never possible, just repeated aborted partial deglaciations. Is there something in these mechanisms that could lead to a permanently glaciated world (after we get over the minor ‘hiccup’ of the current mass insanity of H Sapiens), one never able to fully come out of a glacial? Eventually Snowball Earth? It doesn’t look like the authors considered the role that an open Isthmus of Panama would have had – which matters if you go back 1.5 to 3 Ma – the initiation of North Atlantic deepwater production depended on the sill being closed so the Atlantic would be salty enough. It’s my understanding that this played a role in initiation of glacial cycles. The Isthmus of Panama was fully formed since 2.8 Ma and thus no sizeable circulation could have passed through from the Pacific during the entire simulation period of 3 Ma. With the exception of recent history, there seems to be a steady trend of declining CO2 over the time period. Is this related to changes in bedrock exposure, volcanic activity, or something else? however, when constraints are drawn from glacial periods as opposed to the short term, periodic interglacials, it appears to bias the upper limit constraint to a lower sensitivity. How did you address this in your constraint work? Would a variable sensitivity based on current conditions with a slightly (10% to 35%) stronger ECS during interglacial periods be shown in the reconstruction or would it blow up the model? Re Glenn Tamblyn – There are multiple cycles – the obliquity cycle (changes in tilt relative to orbital plane), precession (wobble in the direction of the tilt relative to perihelion – itself due to the wobble in an inertial frame combined with changes in the orientation of perihelion), and eccentricity variations, which happen with 100,000 year variations but also longer-period variations. Sometimes all the variations will add up to create a stronger forcing – (PS the global annual average radiative forcing is small; the effects are mainly (entirely?) related to redistributions of solar heating over latitude and seasons). During a Snowball, chemical weathering is basically shutdown, so geologic emissions of CO2 to the air can build up over a long time. The ice-albedo feedback is very strong at low latitudes and once in a snowball state, CO2 has to build up to a very high level to initiate a thaw, but then a runaway albedo feedback will lead to very high temperatures. At least that’s my understanding of it – I should add I haven’t read anything new about this in awhile. Generally it is thought that chemical weathering’s temperature dependence would provide a slow-acting long-term negative feedback. However, chemical weathering is affected by other factors as well, such as the location of mountain ranges relative to climate regions. Clarification – there could be a global annual forcing from redistribution of solar insolation due to variations in albedo over time and space (I don’t know what the numbers would be)… I wonder if some conditions that would tend to cause deglaciation would also lead to temporary global cooling? E.g. more sunlight landing on ice sheets. It’s written in the report almost as if it needs to be explained to others in the field. But it would seem to me to be so manifest as to not need any explanation, at all. It’s just obvious. Anyone skilled in this field would already be dealing with the exact same problems and would already know this like the back of their hand. I regularly deal with problems like this in instrumentation I design. Tiny offset errors, integrated over time, become large problems soon. One must work out methods to deal with it. It’s pretty much “ho-hum, what else is new,” so to speak. It is obvious why their approach helps mitigate such issues. Which left me wondering why so many words were spent on it. Is it just that this was such a long simulation period that made it necessary to highlight this issue because other researchers work on shorter periods, enough so that they need this reminder? Regardless, they did a very good job of writing it in a way I think anyone should easily follow well. I’m just curious about why the nicely and clearly crafted explanation was needed, at all. It would seem to go with the business and everyone would already be abundantly aware. Did the removal of regolith thereby exposing substantial bedrock contribute to a sufficient increase in CO2 weathering during the interglacials to create a feedback mechanism that would at least partially explain the decrease in atmospheric CO2 over the last 3 Ma [before we “fixed” that]? Does this study tell us anything about ESS? It sustains my ideas of pliocene with a sudden, extreemly high CO2 content in the atmospherefrom as the atlantic ocean opened and all those oil and gas fields plus vulcanism went into the air, It went enormeously green after a while worldwide, and megafauna that ate it down. Large brown coal and kaolin sediments even at high latitudes,…. until the ice ages came back about 4 million years ago. The result of heating up all that coal gas and oil will be another pliocene situation. I am not alone thinking of it that way. And it sustains the 3 deg/ doubling theory. But in any case, I hope this new study from Potzdam will give a new lift to paleo-climatic studies and arguments. Since this is critical to your explanation of the _gradual_ shift in glaciations – would there be enough of these sediments not to be bulldozed away entirely during the first glaciation? Say, what is the thickness of the sediments that were NOT disturbed by the glaciers (i.e. OUTSIDE the maximum range of glaciers)? Can somebody explain why slower ice flow changes the cycle from 40 000 to approx 100 000 years (and not e.g. 80 000 or 120 000)? Is the 100k Milankovitch cycle really sufficient? Also, why is the 100 000 year cycle so asymmetric? Also, it is often forgotten for some reason that the isthmus of Panama does not separate the Atlantic and Pacific, – it separates the Caribbean Sea and the Pacific. Even if the isthmus were open, the Antilles and the shallow ridge the Antilles sit on would prevent much circulation between the oceans. i dont think the ocean model in Willeit has and AMOC, or does it ? i thought the ocean in CLIMBER 2 was quite simple. A few days ago I posted the following here. However it hasn’t appeared. Since I can’t imagine why this should be inappropriate or irrelevant to this subject, I try again. Probably there has been some technical problem? Why is it not possible for me to publish my comment here? Please enlighten me. OK there obviously seems to be a technical problem which I can’t understand. Sorry if I’m causing any inconveniences. It surely isn’t my intention. Doug MacDougall’s book Frozen Earth calls attention to work done by Marten Melles, et al Science 2011) that uses sediment cores from a Siberian lake to infer a number of atypical interglacial periods in which temperatures were 4 or 5 deg C higher than those today. Was that work reflected in this paper? The paper doesn’t include changes in CH4 and N2O. However, it increases the radiative forcing of CO2 by 30% to account for this. Isn’t 30% slightly on the low side? The regolith aspect is interesting.However, delta deuterium vs CO2 lag indicates that the change in CO2 and methane during the ice ages were an effect of temperature changes, not causing them. The explanation is that the oceans ability to hold CO2 is temperature dependent, and also the methane cycle is strongly temperature dependent. the power of methane in a thawing stage may be underestimated (rapid thawing of methane clatrate). This may explain the assymmetry between the thawing and freezing stages during the ice ages. It is true that the current level of CO2 is way above the intraglacial stages (45%). But the increase in CH4 is even more dramatic (+150%). Re Martin – I’m not sure but I think I remember reading that slower ice flow would allow for thicker ice sheets, with higher surface elevations that would thus tend to be colder. The most up-to-date models are now including tidal forcing, which will enable much better fidelity with real world data. Arbic, Brian K, Matthew H Alford, Joseph K Ansong, Maarten C Buijsman, Robert B Ciotti, J Thomas Farrar, Robert W Hallberg, Christopher E Henze, Christopher N Hill, and Conrad A Luecke. “Primer on Global Internal Tide and Internal Gravity Wave Continuum Modeling in HYCOM and MITgcm.” New Frontiers in Operational Oceanography, 2018, 307–92. Is there any other evidence supporting the hypothesis that the long-term trend in CO2 decline is caused by a decline in volcanic degassing? It makes the (long term) curves fit here, while Milankovitch cycles account for the Milankovitch scale variations, but I was wondering if there is other evidence for the volcanic decline, since other mechanisms (eg weathering, biological productivity) are possible. This presumably wouldn’t affect the important CO2 sensitivity conclusions in any case, provided the same CO2 changes occurred (for whatever reason). This is not an annual signal so I am curious as to which research papers describe this effect. Do these correspond to long-period tidal cycles influencing ENSO? The Bloomberg piece thanks Kate Marvel and Gavin Schmidt of NASA-GISS at the end, so they may have provided the graphic. #36 From the graphic, orbital forcing appears to be about as close to net zero as it could possibly be. #13 Could a situation arise where that final mass deglaciation is never possible, just repeated aborted partial deglaciations. I would have thought not. The flip to 100ka cycles is interpreted to be due to exhaustion of the accumulated regolith supply about a million years ago. Since then we’ve been in a stable cycle, with interglacials presumably being too short to recharge it. Until we interfered, of course. By cancelling the next glaciation, we may have allowed time for enough material to accumulate to take us back to a Pliocene state. In which case, when the CO2 eventually falls, we might expect to start with 40ka cycles. #30 I’d be surprised if the model had the detail of a single Siberian lake. But you might want to consider that, other things being equal, land is warming faster than sea. And the interior of continents faster than coastal regions. And the Arctic faster than everywhere else. And that if you’re somewhere with seasonal melting, there could be step changes in average annual lake temperature when it gains or loses a buffer such as seasonal or year-round ice. And that one lake is not the globe. Oh, and that as the paper explains, those glacial-interglacial cucles are understood, as are the reasons for them happening. Forest fires existed before humans, but there are still cases of arson and accidental human ignition. And criteria for identifying them. glacial lowering of atmospheric CO2 in the model is controlled by lowered sea surface temperatures (SSTs) and changes in ocean circulation, in particular enhancement of Antarctic bottom waters and decrease of deep ocean ventilation. Elevated carbonate weathering on exposed shelves and enhanced nutrient utilization in the Southern Ocean due to enhanced dust deposition also play important roles, especially toward glacial maxima. Reorganizations of the Atlantic meridional overturning circulation during glacial terminations contribute substantially to deglacial CO2 rise. So Willeit et al. are already modelling the processes Farmer et al. discuss. They probably haven’t calibrated to Farmer et al.’s new data because it’s too new. But I don’t think the two papers are incompatible. As I see it, Farmer et al. have provided more material to improve that part of CLIMBER-2. Thanks for the comment. Agreed that the Farmer data is too new to incorporate into CLIMBER-2. I note that Climber 3a has been about forawhile, with our host Rahmstorf as one of the authors. I would like to see a model covering Eemian to present, say the last 150 or 200Kyr, since we have more detail data for that period. It might resolve the question of the actual sea level at the end of Eemian, which seems to be critical to estimate sea level rise risk in the nearer term future, say the next couple centuries. I shall have to look at latest from PALEOMIP. It could be much closer to zero and more gradual considering that the orbital changes are thought to have a ~20,000 year cycle time and not the rapid fluctuation shown … unless they are considering lunar and solar cyclic tidal factors impacting ocean circulation or sloshing. Yet, very few GCMs include tidal forcing, excepting the recent models (see the citation in #34). Wonder how it correlates with the Nenana data… Gavin? S 35: Is there any other evidence supporting the hypothesis that the long-term trend in CO2 decline is caused by a decline in volcanic degassing? BPL: It would be a very long-term trend. I think it more likely that over the Phanerozoic, we’ve had more weathering due to mountain uplift. Not sure how to quantify it, though. Thanks for the link sidd. Amusingly, my first search came to an erratum, acknowledging a publisher’s error. Back in the dead-tree days that happened to me with a basin modelling paper, but annoyingly they didn’t acknowledge that it was a publisher’s error. I’d corrected a typo when proof-reading Equation 1 (the first publisher’s error), which meant it had to be split across two lines, and they then inserted the denominator on both lines, a second error as the numerator was a product not a sum. Grr, I’ve just noticed another error which I don’t recall picking up. 2 (subscript) a for 2 (times) a. At least that was obvious because it wouldn’t make sense. 2 (superscript) a would not have been obvious (although the fact that a is about 1E5 in S.I. Units would be a clue). In fairness I did have 18 equations, many of them with a three- or four-step derivation that was not numbered, so it must have been a manual-typesetting nightmare. To crown it all the correction never made it into the subsequently digitised version! Fortunately it was just a restatement of a standard equation, which was already known to anyone Ordinarily Skilled In The Art, not something new. Ironically, the classic paper from a decade earlier had a different typo in the same equation. And now I look I spot another in his Equation 4. The perils of manual typesetting! That one was published in EPSL, which in those days was not proof-read by the author, in order to achieve a faster turnaround. Just as well they weren’t climate papers, or people would be claiming that their audit showed our research couldn’t be reproduced, or that scientists can’t do sums! Of course back in those days the audience consisted entirely of individuals Ordinarily Skilled In The Art, who were expected to derive and code up their own equations, and recognise a typo when they saw one. Returning to topic, it looks like CLIMBER-3α is still a work in progress. I presume the added ocean complexity would have made it impractical for Willeit et al. to run 1000 overlapping 500ka simulations using CLIMBER-3α. This may be the paper that is establishing the link of orbital forcing from the short-term time-scales to the millenial scale. which may imply that this is the source of the decadal and sub-decadal variability described in comment #36. The research should give more credence to the idea that orbital tidal forcing at the fortnightly-to-monthly-to-annual-to-decadal timescales also has a significant impact on temperature variability, mainly via its impact on ocean circulation, a la Munk. To continue my previous thought, to model Eemian, SICOPOLIS would have probably to be updated to have dynamic antarctica. What really surprises me in Willeit is that you can get so far with just northern hemisphere dynamic ice and static antarctica. Including the MPT transition. Entertaining article and comments. Sort comments by “best”. #14 James Cross, #35 Simon C asking about decline in CO2. Some research saying having the right rocks in mountains in hot rainy areas is managing the CO2. I haven’t read a lot about it but here’s some of it. It covers the very long time scales, and the writeup suggests they still need more evidence. But warming leads to increased rainfall, so speeds erosion and drawdown of CO2. So they suggest that Indonesia and Papua New Guinea are major sinks of CO2. What nature takes away, it seems to give, too. Another paper finds that in Taiwan, mountains with carbon-rich rock are having the other effect – the carbon’s getting eaten by soil microbes, emitted as CO2, and erosion speeds that, too.